Home » Children's Books » Let’s Count to 100! 100. To a child, 100 may as well be a million. For a young child, just trying to imagine 100 of anything seems a daunting task. When asked to visualize 100 objects, a child may consider a small handful of pennies or a football stadium full of fans. Teaching a child early number conceptualization is so important, but can be so hard to do. Younger children often don’t have the patience, interest, or confidence to tackle math problems. When a children’s picture book comes along that not only inspires kids to embrace math, but also engages, captivates, and delights them….wow…you have found a keeper. 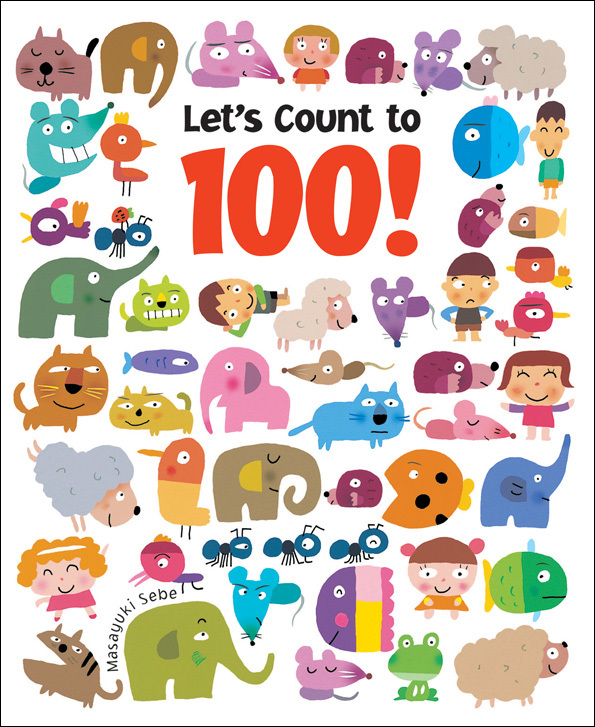 In Masayuki Sebe’s “Let’s Count to 100!”, you find more than your average counting book has to offer. As a kindergarten teacher, I’ve seen my fair share of counting books. Picture books that center around a mathematical concept are becoming more and more popular. 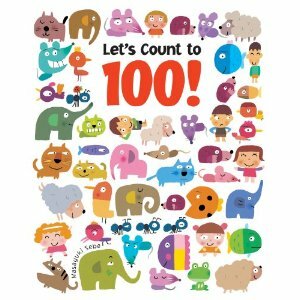 What sets “Let’s Count to 100!” apart, is total kid appeal….This book will have your kids counting to 100 over and over again…(and then again!) Through delightfully detailed illustrations and fun surprises on every page, children unknowingly are introduced to some pretty big mathematical concepts! (Score one for Masayuki Sebe!!) Using pictures, humor, and the ever popular seek and find concept, Sebe introduces children to the number 100. Each page features 100 colorful friends, arranged thoughtfully into 10 groups of 10, easily separated and distinguishable by color, shape, etc. On each page, your child is asked to count, find, or notice something specific, keeping them actively engaged as you read. Scattered throughout the pages you’ll find bits of humorous text sure to send the 3-5 year old crowd into fits of giggles (at least if your kids are anything like mine! )The illustrations flow from page to page, as the characters recur throughout the pages, helping to again keep children connected and engaged with the text. While my son was going crazy for the “hot dog fish”, busily searching for the child with the soccer ball, or counting up the ants carrying candy, he was learning (and loving it!) Even now as I was writing this review, my son came over and stole the book from my desk and is now happily counting objects on each page. This book is fun, engaging, and right up a child’s alley. As your child counts adorable sheep grazing in the meadow, hunts for the hidden ladybug, and delights at the whimsically colored elephants, they will be soaking up rich mathematical information….learning and counting each step of the way. I know you’ll find 100 reasons to LOVE this oh-so-much-better-than-your-average counting book from Masayuki Sebe and Scholastic. Now, Let’s Count to 100!! This book can be found in the January SeeSaw book club flyer for just $4!! Head over to Scholastic to check out this book and the thousands of other great titles they offer!! One of you has the chance to win a copy of this book! Good luck and happy counting!! i am familiar with scholastic, but only can think of a hazy recollection of a dog in teh grass…lol I cannot remember the book title…but i remember reading it often! I love how cheap their books are! I would like to win this book for my daughter Eloise. My little girl would love this! Thanks! My mom is a teacher and we have loved getting Scholastic book orders for years. Thanks! I love the awesome prices scholastic always offers. I can’t pass up the 99cent books! I’d love to win this for my son whose been obsessed with numbers since 13 months old. I am a member of Scolastic book clubs. I love that every time I place an order online her school gets a free book. I love that Scholastic books are so affordable and there are so many to choose from. I would love to win this for both my kiddos! I would love to win for my Kindergartner! Thanks! I would love to win this for my 3 year old son! I remember when in school they had the scholastic book order…that was my favorite! I loved whenever I could go home and beg my parents to buy me a book because they always would! I love that they published Harry Potter in America! I LOVE scholastic book club. I get just as excited as my kids when they bring an order form home. They have good prices and there’s no sales tax. i want to win it for my godson and i love their huge selection!! My boys! Specifically the oldest (almost 3) for his birthday next month. I remember them from when I was in school- their prices are wonderful and the titles are classics! I would love to win this book for my 4yr old. If not, I may just have to order it myself. I would love to wi this for my two kiddos!!! I love the book club and the offers they have in the schol systems. I’d love to win for Danny! I’d love to win this for my 3y.o. son. He’s really been interested in numbers and counting lately. I think he’d absolutely love this book! I love that Scholastic has been printing older, out-of-print children’s books. I grew up reading “The REAL Mother Goose” and couldn’t find a copy when my oldest was little. I was so happy to find that Scholastic is now printing it when I started looking for it for my little guy! I keep them here so I can share with all of the gran’s …and I always loved book clubs when I was a kid. The excitement of ordering and then waiting for you purchase to arrive at school and sharing the goodies with your classmates if you could get away with it. I would like to win this for my 3 year old son.